Interested in conducting research this summer related to improving our understanding of the human body and/or human health? Don’t know where to start? 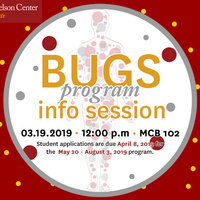 Please feel free to attend our BUGS program info session on March 19, 2019! The BUGS Summer Research Program provides full-time paid summer research internships to undergraduates to allow them to gain hands-on experience working in a collaborative research environment. We welcome students from any major to come if interested. A few former BUGS and mentors that have participated will be present for you to ask any questions regarding the program. Please visit the page Bugs Program for further details.